Here Hazrat Sultan Bahu Rahmatu-Allahe Ta-aala Alaihe says that those blessed persons, whose nature Allah Almighty has kept Pure, they come out Pure and Clean even after living in different carnal impurities and worldly contamination because when they mix in the River of Wahdat of the Pir-e-Kaamil, all their dirtiness gets cleansed. However, it is a matter of regret that such Rivers run and flow in the world but there is no heart that can feel and find these rivers. 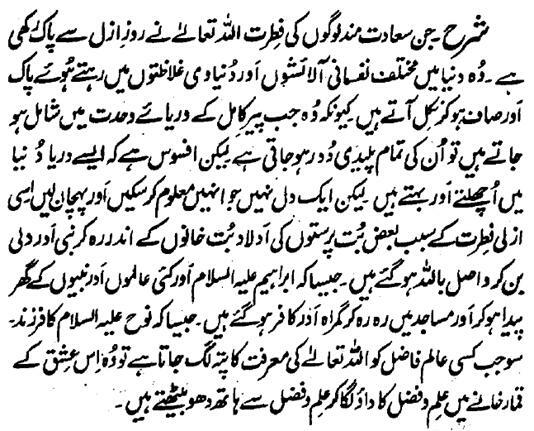 Due to this nature of Azal, some persons were those who were the children of idol worshippers and lived inside idol temples yet they became Prophets and Aulia and became Waasil with Allah like Hazrat Ibrahim Alaihis-Salaam . On the other hand, there are many persons, who were born in the houses of Prophets and liven in Masjids yet they went astray and became Kaafir like the son of Hazrat Noor (Noah) Alaihis-Salaam . Hence, when some Aalim Faazil has found the Marifat of Allah Almighty, he loses his possession of Ilm and Fazal in the bet of knowledge and excellence in the casino of this Ishq!